There was a buzz of excitement onboard the ship as we approached Venice, our final destination. We were scheduled to arrive in port at 3 PM. The cruise director made an announcement recommending all passengers make their way to the top decks at 2 PM to witness the ship's entry into the canals of Venice. 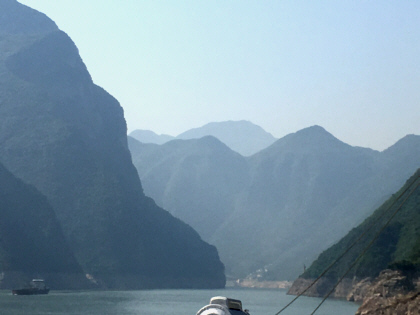 As we stood on deck looking at the beige and rust-colored buildings at the water's edge, the cruise director narrated over the PA while classical music played in the background. The city looked just like the pictures and paintings I've seen. By 4 PM, we were off the ship and following our guide to begin the Doges' Palace, Gondola Ride & Glass Showroom shore excursion. We followed her over a few pedestrian bridges and then to a dock to board a shuttle boat. There are no roads in Venice. The only vehicle traffic is boat traffic on the many canals. This meant we had to get used to getting on and off boats. It was a little unnerving at times because choppy water conditions could really get the boats bobbing. We were in Venice during Italy's labor day (May 1). This was also a Saturday which meant the city was extra crowded. Water taxi's and shuttle boats jockied for position to let their passengers off at the San Marco landing. 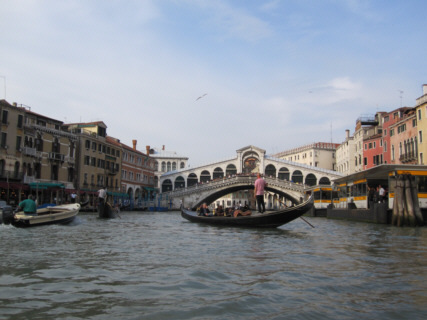 This is the landing closest to the city's hugely popular attraction, St. Mark's Square (Piazza San Marco). This area was crammed with people. We followed our guide off the shuttle boat, placed our ear pieces in our ears to hear her, and did our best to follow her through the dense crowd. She hoisted a paddle containing our group number above her head to help distinguish her from the other tour groups. Interesting enough, through all the commotion, I could have sworn I saw Anthony Bourdain, host of the Travel Channel show, No Reservations. If that wasn't him, the guy could have passed for his twin brother. Anyway, before I could get a closer look, he had disappeared into the sea of people. We walked up and down the steps of two or three pedestrian bridges. Not only were these bridges jammed with people but there were also street vendors with their goods such as purses and leather products lining the steps and sidewalks. Most of these vendors appeared to be of African descent. I don't think they were authorized sell items in this area because when we heard a whistle, presumably from a lookout man, they gathered their goods and disappeared into the crowd or into an alley within a blink of an eye. Our first stop on this tour was Doges Palace. One advantage of visiting this attraction with a tour group is that you don't have to wait in line. We simply bypassed others and followed our guide into the entrance. 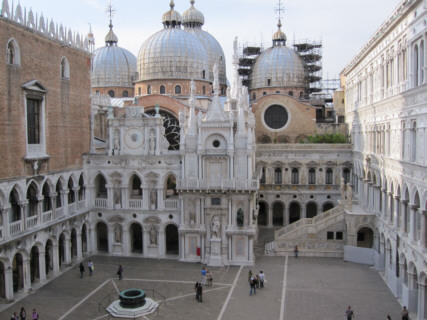 For centuries, Doges' Palace housed doges (elected Venetian rulers), courts of law, and seats of government. The palace was constructed in 1309 but has been destroyed and rebuilt several times up until the 16th century. We were led into the courtyard where there was a large cistern adorned with intricate figurine sculptures. We were surrounded by ornate buildings containing elaborate archways and statues. 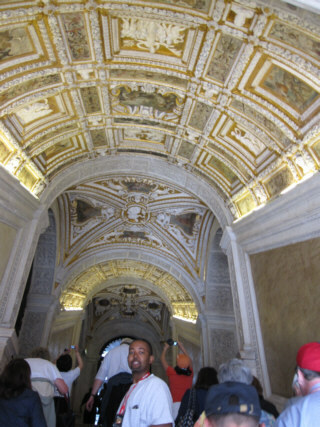 We made our way into the palace by walking up a stairway covered by a beautiful, gold-lined, arched ceiling. Upon reaching the top of the stairs, we were no longer allowed to take pictures. We were led through rooms such as the guest reception hall and the grand council chamber. Among the things I will remember most about the Doges' Palace are the large paintings on the ceilings. These huge masterpieces were framed in gold. We gasped when we saw these awesome works. Our guide interpreted some of the subjects in the painting. 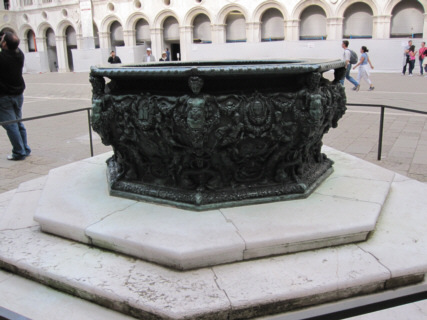 They mostly symbolized the balance of power which was so important to the Venetian government. I love this palace entrance. We crossed the Bridge of Sighs. This enclosed bridge got its name supposedly because it was the last time prisoners were able to gaze at the beautiful city before being led to the prisons of Palazzo delle Prigioni adjacent to the palace. We visited the prison cells. This place looked like a medieval dungeon right out of the movies. It was a dark and dreary place. Casanova was imprisoned here before he eventually escaped 15 months later. We had to be careful as we walked through the low doorways. One man in our group found this out the hard way when he smacked his head into one of these low openings. Fortunately, he seemed to be okay. 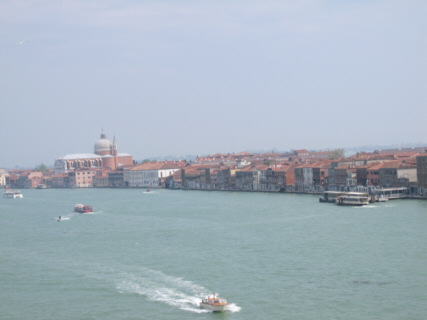 One of the trademarks of Venice is Venetian glass. After leaving the Doges' Palace, our guide took us to a glass shop located just off St. Mark's Square. 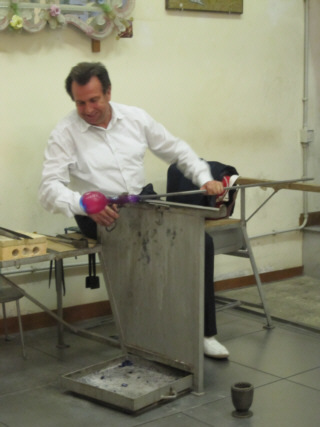 We were invited to the top floor to watch one of the workers pull molten glass from a furnace and shape it into a vase. He also made a glass cat. Each of these creations took him less than five minutes. We were then given time to browse the showroom and purchase some of the Venetian glass made on the premises. There were some very beautiful pieces in many colors. However, they were very expensive - some topping $15,000! We did not buy anything. Instead we used the remaining time to browse some of the shops surrounding St. Mark's Square before we needed to regroup. 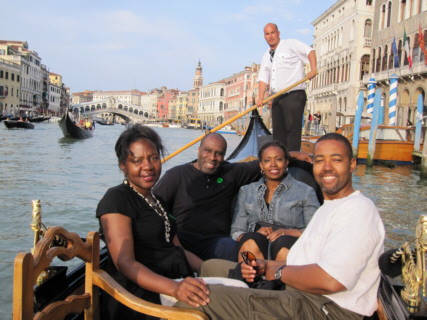 The final activity of our tour was the must-do activity when in Venice - a gondola ride down the canals of the city. Sugar, Audie, Traci, and I shared a boat with one of the staff from our cruise ship who happened to be in our tour group. The rest of our tour group traveled six people per gondola. For me, this 30-minute ride down the canals of Venice was another one of those pinch yourself moments. 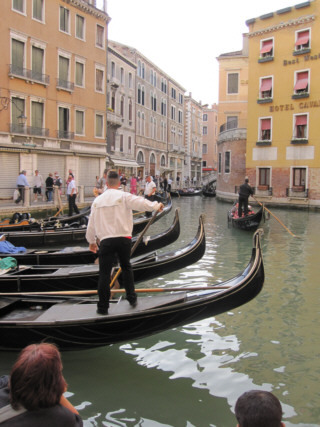 We traveled down narrow back alley waterways and then onto the scenic Grand Canal. Our gondolier did not exactly portray the romantic images I had scene on TV where the gondolier rows couples down the canals and under bridges while singing. Instead, our gondolier spent the time smoking a cigarette and having loud conversations with other gondoliers as they passed. He even got on his cell phone at one point. I didn't mind though. I was too caught up with experiencing the beauty of Venice with my loved ones. Our gondolier did take a break from his social multi-tasking once to point out the former home of the Italian classical composer, Antonio Vivaldi. "I can't believe we're in Venice!" With the gondola ride done, we regrouped and followed our tour guide back to the shuttle boat which returned us to our cruise ship. I had really enjoyed this shore excursion. Even though Venice was the final port of call for our cruise, we did not have to disembark from the ship until the following morning. We spent the remainder of that evening eating our 'last supper' and preparing to leave the ship. The four of us planned to spend extra time in Venice after the cruise (Sugar and Audie one extra night; Traci and I two extra nights). We had reserved rooms at the Hilton Molino Stucky Hotel. I had the task of figuring out how to get there from the ship. I was having trouble getting consistent information. I had emailed the hotel earlier in the week. The reply I got was to take a water taxi that would cost 60 euros (approximately $90). However, when I saw that our ship was docked just across the canal from the hotel I knew there had to be a less expensive means of transportation. I was certain I had read on the hotel's website that it provides complimentary shuttle boat service. Therefore, I had the Guest Services desk of our cruise ship call the hotel for me. Having Guest Services make the call saved me the $7.95/minute charge that I would have incurred if I called from my stateroom. Anyway, the lady at the hotel confirmed that there is a complimentary shuttle boat and one of its stops, Zattere, is in walking distance from our ship.